Mobile World Congress is currently happening in Barcelona, and everyone over there is very busy shotgunning sangria and talking about all the announced new phones. Like the LG G6 with its wacky aspect ratio and the Nokia 3310 with its nostalgic design. No one is talking about Samsung phones, because Samsung did not announce a single phone at the event. Instead, it hinted at the announcement for the eventual Galaxy S8. Which is why everyone is confused over this press release Samsung dropped this morning. 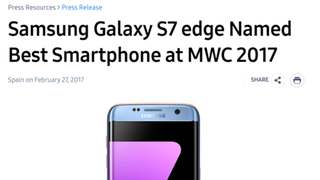 Samsung’s big win comes courtesy of the Global Mobile Awards, which already gave the top honor to the Samsung Galaxy S7 Edge in 2016. Why? It could be a random Oscars joke—what with La La Land winning and the losing the Best Picture award last night to Moonlight? Or it could be a serendipitous accident and these two different award shows fail at awarding. Or the Global Mobile Awards could just be terrible. We’ve reached out to Samsung and GSMA (which hosts the Global Mobile Awards) for comment. Update (2/27/17) A Samsung representative responded with the following. Every year, the GSMA recognizes the best smartphone, with an award based on the performance from the previous year. We’re proud to announce that the GSMA judges selected the Galaxy S7 edge as the Best Smartphone 2016 in the Best Mobile Handsets and Devices category. The award was given during the 2017 GLOMO awards ceremony.